As Thanksgiving approaches and the fall season turns to winter, California’s abundance of floral offerings doesn’t even think about stopping. 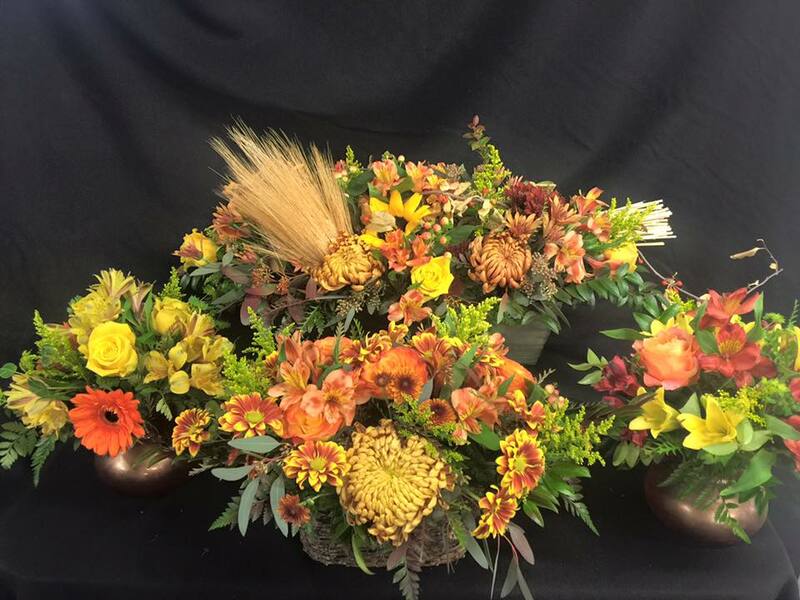 Our amazing climate continues to offer talented designers from all the over the state amazing choices when it comes to fall floral designs. 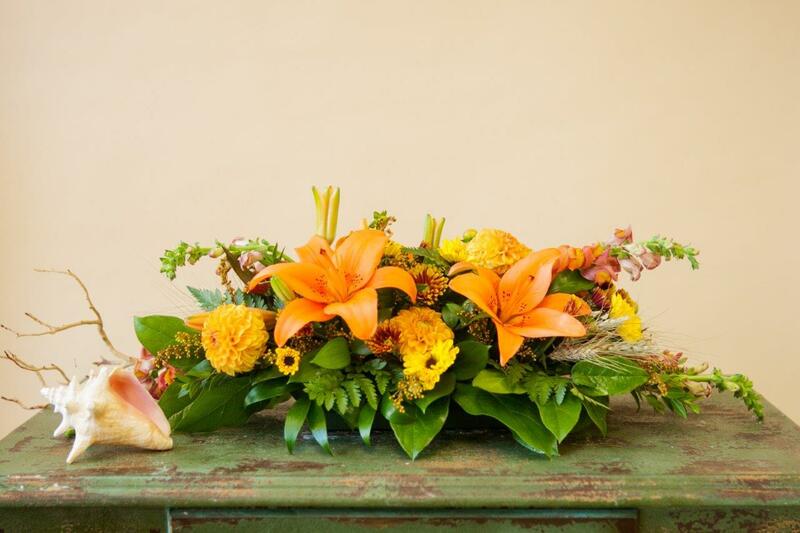 So when you begin to think about your Thanksgiving table, don’t forget to add an arrangement of California grown flowers. There is a style to fit every décor and color scheme. These beautiful elongated tablescapes from McCool Flowers show just how gorgeous the traditional table arrangement can be. The beautiful orange and red colors really pop and would look stunning on any table. Plus these are low profile so they’re great for passing delicious dishes across the table! This gorgeous centerpiece is something you won’t see every day. 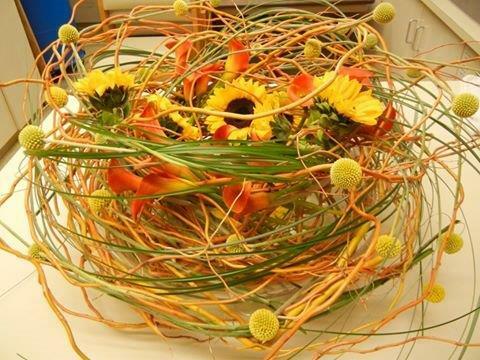 We love how Kay Wolff Design incorporated the natural elements of Curly Willow and Bear Grass with the Billy Balls, Callas, and Mini Sunflowers. Bringing the outside inside is super cool! 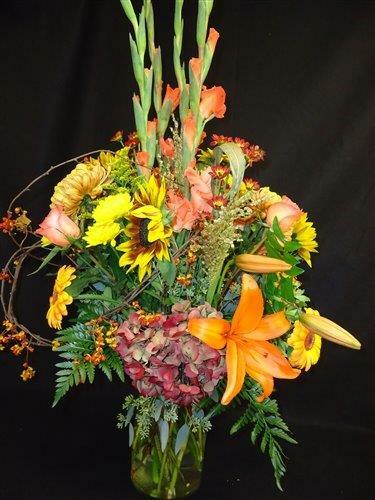 This asymmetrical design by Yuba City Florist would be a welcome addition to any fall décor in the home. 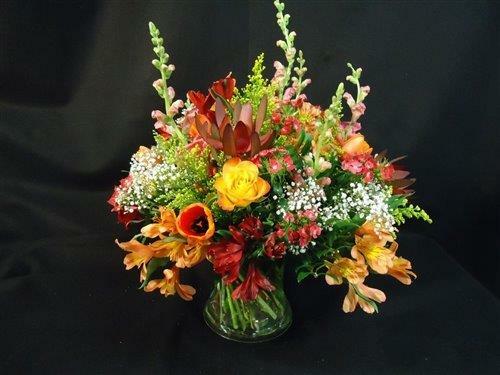 The Safari Sunset, Asltromeria, and Solidago are classic fall flowers used in an updated design concept. 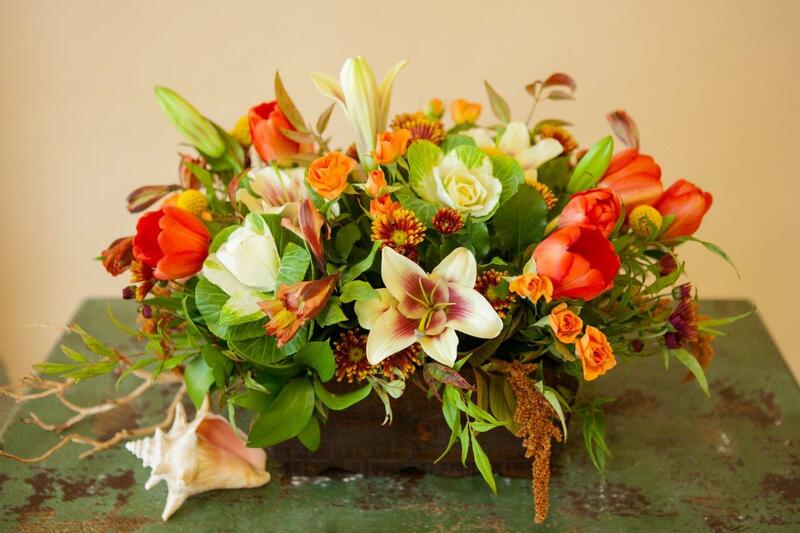 Who says fall arrangements need to only have traditional fall colors? Incorporating some of the typical fall colors and then adding pops of vibrant pinks and reds is a great way to blend textures and make a statement like this design by Ames Haus. 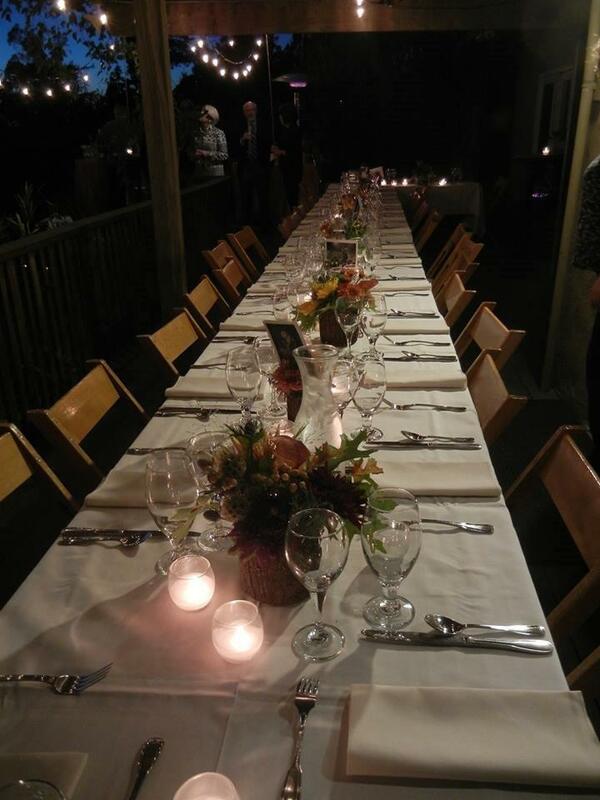 Adding various small arrangements to your table will surely add a level of elegance and beauty to any dinner party. Consider adding more than one arrangement to your table and incorporating candles to add more dimension to your table. Vases and containers can also make a warm impression like these wood ones used by Kay Wolff Design. If you are celebrating Thanksgiving at a loved one’s home be sure to bring the host a fresh bouquet to show your appreciation. You can even have the arrangement delivered directly to the host’s home so you have one less thing to take care of on Thanksgiving Day! 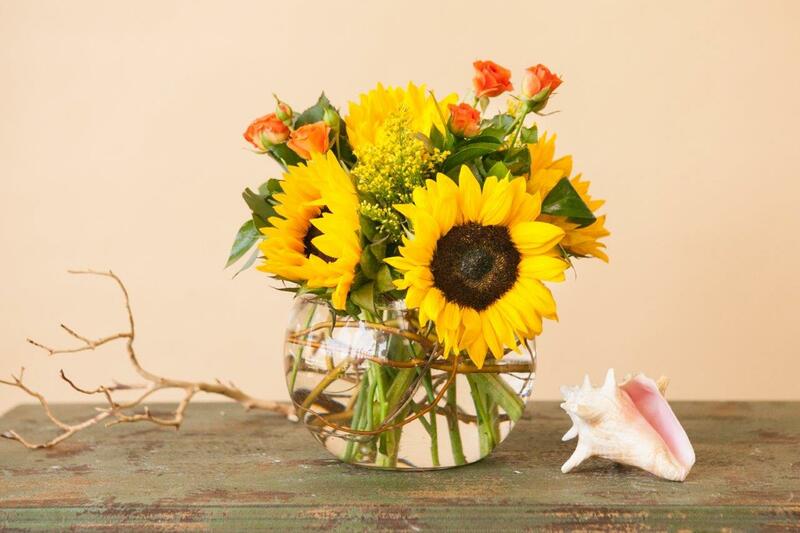 This simple arrangement by McCool Flowers evokes the fall season with Sunflowers, Curly Willow, Spray Roses, and Solidago. 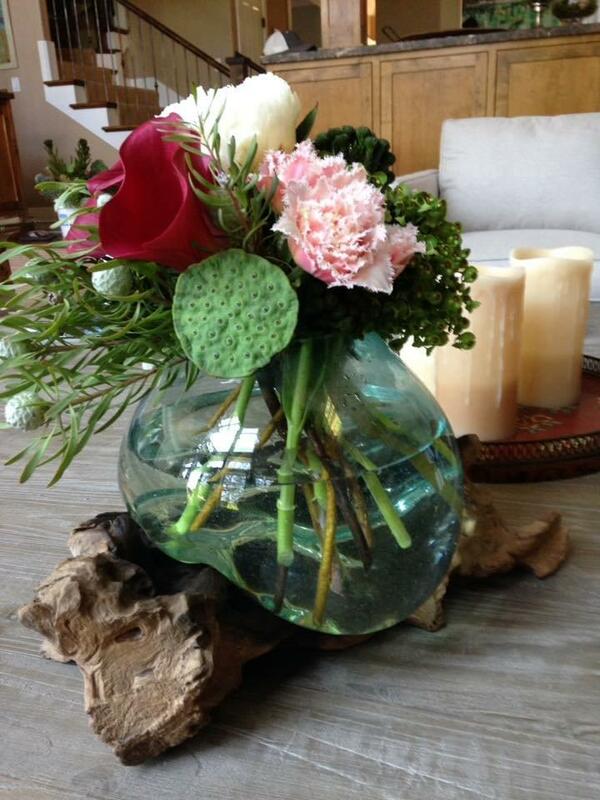 For the more modern hostess try sending something with organic elements such as Lotus Pods and Callas in an upscale vessel like this one from Kay Wolff Design. 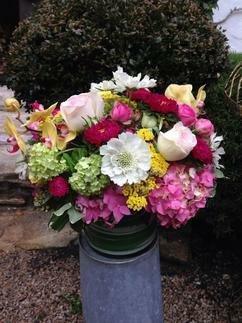 Of course, if you really want to make a statement send a tall stunner like this beauty from Yuba City Florist. Won’t it look beautiful on a foyer table? However you choose to celebrate the upcoming Thanksgiving holiday, we hope you take a moment to count your blessings and remember all that you have to be thankful for. We are so grateful to all of the members of CSFA, California’s flower farmers, wholesalers, and retailers, we know the hard work that goes into every CA GROWN floral arrangement and bouquet they make. From all of us at CSFA we wish you a festive and happy Thanksgiving! A special thank you to Ames Haus, Kay Wolff Design, McCool Flowers, and Yuba City Florist. You guys rock!